I am very excited to be able to branch out my review items to things other than movies and educational products. Don't get me wrong, I love reviewing stuff for school. But sometimes it is nice to mix things up with other useful and unique products. Everyday Homemaking offers practical advice for busy families. The website is a wealth of resources designed to help save you money and time. Focusing on homemaking and homeschooling, Everyday Homemaking has tips, products, and encouragement to help you manage your home better. Most folks familiar with my family know who runs the kitchen in this house. No, it's not the long-haired gal with almost a half-dozen children hanging on her skirt hem. It's that banjo-playing bearded gentleman. He cooks away, making most things from scratch, and our family is better because this is one area that I don't have to work into my schedule. Sometimes my bearded warrior is unable to feed his hungry clan and I am forced into the kitchen by the constant wails of hunger. I am not the best cook, but I have improved over time. I no longer drown in the kitchen, but I have a long way to go to reach the shore. The kids will eat what I serve, but only because they already had cold cereal for lunch. Enter my new go-to cooking resource: Everyday Cooking. This text is so much more than a cookbook. It is a time management savior for cooking. Not only for cooking, it offers many food prep, storage, and buying tips as well. Prepping and storing my chicken the "new" way not only saved me time and space, it also saved me twelve bucks! Well, of course I used it to cook with. I received the e-version of the book and it was so easy to transfer to my kindle and start going through. The books contains over 100 tried and true recipes, as well as measurement helps, meal planning, shopping hints, basic cooking skills (big help for me), additional resources and more. I like how the book starts right away with some suggestions of things to do to make your whole week of cooking easier. Instead of looking at an individual meal, you are looking at cooking as a unit that makes up the entire week. She is teaching you how to get the basics done to have on hand and ready, thus saving you time later. Instead of boiling two eggs, boil six so you have some ready next time you need them. As you read the book you'll see lots of tips alongside the recipes. These tips are so helpful. We don't buy canned cream of anything soup, so when a recipe calls for it, we're sunk. She teaches you how to make it on your own, and it takes five to ten minutes! Not a lot of the recipes in the book take cream of something soup, but a lot of recipes out there do. There are also color photographs demonstrating techniques and cooking items. Our absolute favorite recipe was Anna's Blue Ribbon Chocolate Truffles (page 61), but I didn't manage to get a picture before they were all eaten! Maybe I'll add one to a future Quick Takes or blog post because I know we will be making them again soon. 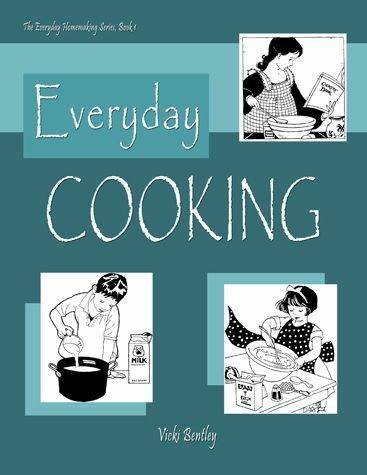 Everyday Cooking is available on the Everyday Homemaking website for $17.99. I received the e-book version, and although very convenient to have on my Kindle, I have decided that I don't like this format very much for a cookbook. I just don't like having my Kindle Fire in the kitchen. It makes me too nervous that something will happen to it. I enjoyed this cookbook so much, that I plan to purchase the hard copy for myself soon. In addition to the cookbook, Everyday Homemaking offers a Family Chore System program, several kitchen appliances, homeschool helps, and more. 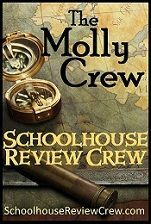 My fellow crew members over at the Schoolhouse Review Crew looked at the cookbook and the Family Chore System. Click below to check out their reviews, or click here. Disclaimer: As a member of the Schoolhouse Review Crew, I received the e-book Everyday Cooking for free in exchange for an honest review on this blog. I received no other compensation. Everything looked so yummy. Great review! We really haven't found anything yet that we haven't liked. It's a great cookbook! Love the food photos :) You are right, a lot of love can be seen in a messy kitchen. Ill use that as my excuse from now on! What great photos! We love the truffles, too, and Anna won a blue ribbon at the state fair with those! I enjoyed your thorough and thoughtful review.